Evan Johnson, a junior at St. James Academy, Lenexa, exchanges “warm fuzzies” with a fellow leader, an activity in which the retreatants give one another affirmations. The heart he is wearing was made by his small group. Lenexa — The Gospel of Luke is not often linked with giant inflatables. 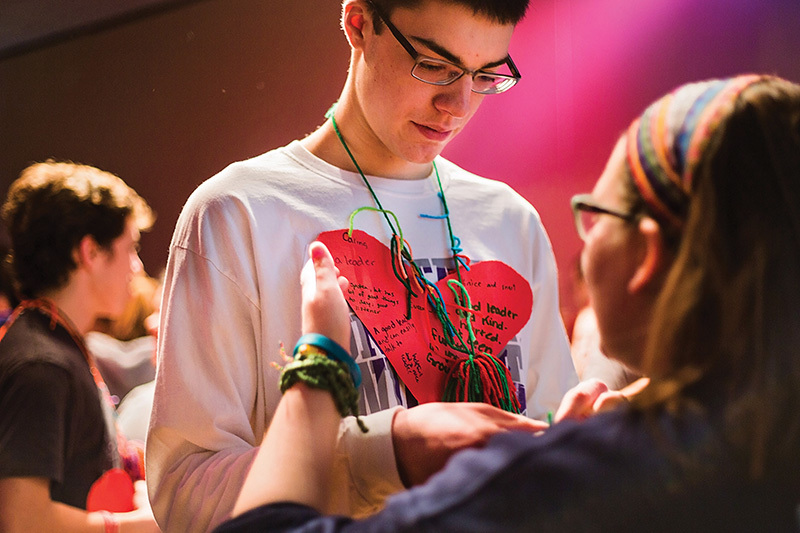 But from Feb. 26-28 at Holy Trinity Parish in Lenexa, you couldn’t miss the connection as a team of high school students hosted a retreat combining quiet reflection with rowdy team-building activities for area seventh- and eighth-graders. In one of the activities, the nearly 80 youngsters were divided into two teams and competed on the Luke 18 obstacle course. Which seemed entirely appropriate for a retreat named after a famous passage from Luke: “For the kingdom of God belongs to those who are like these children” (Lk 18:16). Luke 18 is a two-day retreat program designed for seventh- and eighth-grade students. It offers a variety of small and large group activities intended to help them grow in relationship with God and their peers. The retreat is led by a team of high school students who are, in turn, overseen by college students. “When high school students share the faith — or, really, in any situation in which youth speak to youth — there is often a message conveyed that is beyond words,” said Kris Walters, director of youth ministry at Holy Trinity. The parish has hosted a Luke 18 retreat for the past 10 years, said Walters. And the benefits have been boundless. It’s clear that the middle school students cherish the bond they have with the older teens during this retreat. Every leader plays a special role in the retreat. The freshmen and sophomores are involved with the logistics, while the juniors and seniors lead small group discussions and give talks. “The middle school students see and hear the stories and experiences of those who are close to them in age — kids to whom they can easily look up to and to whom they can easily relate,” said Father Gerard Alba, associate pastor at Holy Trinity. The high school leaders, in turn, are able to share their life experiences and give advice to the younger kids through their presentations. “You can relate to [the high school leaders] and see how they dealt with things, and [know that] you can deal with it, too,” said Pruss. The gravity of the talks intertwined with a variety of fun activities allow the kids to open up and share the faith in an honest way. “Everybody’s welcoming, so it’s helped me meet a lot more people,” said Kohl Boge, an eighth-grader from Prairie Trail Middle School in Olathe who is preparing for his upcoming freshman year at St. James Academy in Lenexa. Luke 18 was a way for Boge to meet other kids from Holy Trinity who will be attending St. James as well. Another interesting aspect of the retreat is that the attendees stay overnight at “sleep homes” within the parish community, which provides a special way for Holy Trinity families to get involved. “What makes this particular retreat a unique experience is that it brings together people from all ages and all walks of life,” said Father Alba. It really is a glimpse of heaven and of the church, he said. Luke 18 is successful because of its mission, which is both relevant to the lives of the middle school kids and beneficial to the faith journeys of the high school and college leaders, said organizers. “The number one thing we hope students get from this experience is feeling loved by God through others in a new way,” said Walters. The high school leaders take this goal very seriously. “Knowing that I was in their position at one point in my life and looking back at that, I want to help them,” said Natalie Dykmann, a senior at St. James Academy, who has both attended and led the retreat. Ryan Lobb, who is also a senior at St. James, has a similar outlook. This was his fifth Luke 18 retreat. What keeps him coming back is a desire to be a positive influence on the younger kids. “To come to retreat and know that you’ve got high school students that love you is a big deal,” he said. “It’s had such an impact on me, and I feel like I should give that to the next generation of whoever’s going to come,” he added. “[The leaders] often become an inspiration for how to keep pursuing the God and faith stuff, no matter what life throws at you,” said Walters. Not only are the leaders impacting the younger kids, but the enthusiasm and curiosity the middle schoolers bring to the retreat has influenced the high schoolers’ lives as well. Although Luke 18 isn’t new at Holy Trinity, the hopes for its success continue to soar each year. “We want the teens to experience Christ through his church, this community of love,” said Father Alba. For Walters, finding ways to make the Catholic faith relevant and significant in the lives of these young people is key.